The upcoming exhibition at Pace Gallery will reflect on Tim Hawkinson’s twenty years long but nonetheless exciting artistic career. His works are made in a wide range of diverse media, from sculpture, photography and painting, to the less conventional forms of installations and collages. The motif that holds them all together is Hawkinson’s endeavor to play with the common materials and objects, to put the everyday out of context and to reinterpret reality. As a consequence, the audience finds new ways of seeing the regular life and perceiving the world around us. With regards to the concept of deploying everyday materials that are, above all, accessible, Hawkinson often uses his own body as a base in creation, or as reference. The ways that his body is embedded in his works are various. For Balloon Self-Portrait #4 (1996), the artist used his body as a cast, which helped him make the inflated foam-filled silicon skin that was suspended from the ceiling. 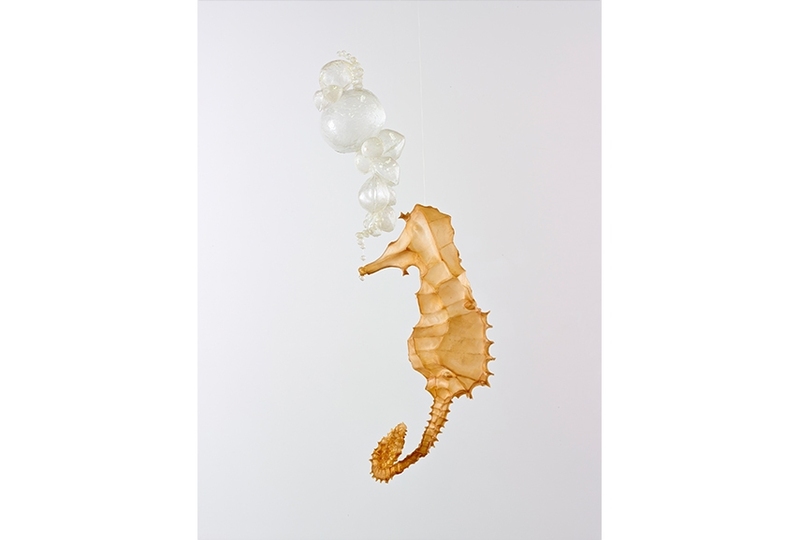 He also uses imprints of his body parts, such as knuckles, elbows and knees, to create parts of his sculptures and assemblages, like he did with Tegalong (2013), a four-foot tall seahorse. 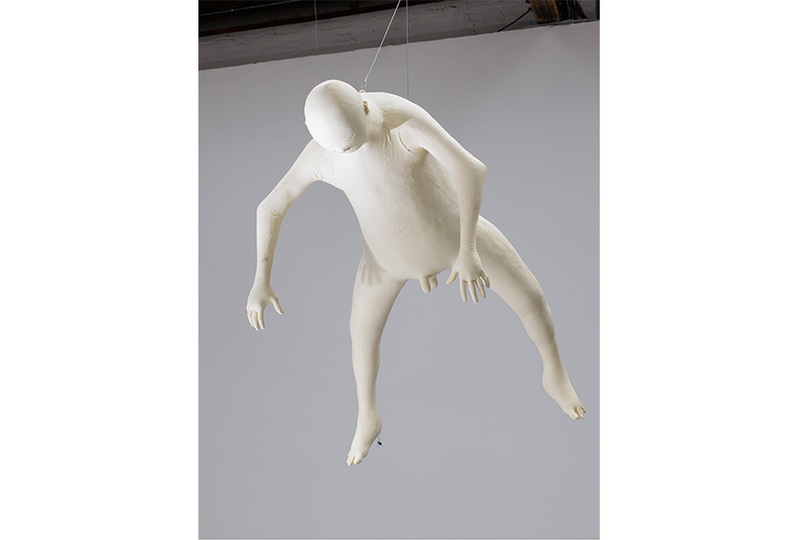 However, it is not only his body that Tim Hawkinson brings into his works. Signature (1993) is an example in which the artist cleverly and provocatively translates his own being into a machine. In this piece he practically gave life to a combination of working parts that penned the artist’s signature onto sheets of paper. 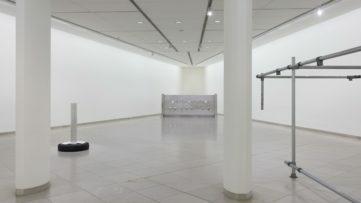 The intention behind the piece was to gradually indicate the passing of time, which is both poetically and factually represented through the pile of signed sheets that appeared on the floor of the gallery. This installation can be defined as one of his rather complex and witty kinetic sculptures, to which many of his other works also belong. 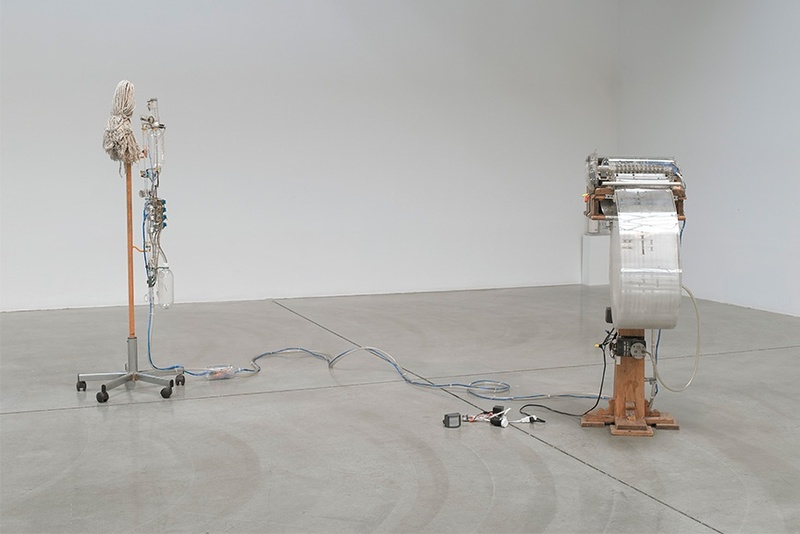 Tim Hawkinson has an excellent ability to turn basic things into unpredictable arrangements. He is always working both with our mind and previously learned experience, while provoking our senses simultaneously, through the visual and the audible, through sculpture, installation and two-dimensional works such as paintings and collages. Counterclockwise will be one of those comprehensive exhibitions that aim to translate the artist’s overall intent and sensibility in the best way possible, a survey of his continuous pursuit of new processes, through which he re-imagines the world. 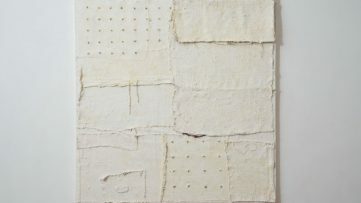 The exhibition is the artist’s fifth solo show at the gallery since joining Pace in 2005. Counterclockwise will be on view from February 26 through April 23, 2016, at Pace Gallery in New York. An opening reception will be held on Thursday, February 25, from 6 to 8 p.m. 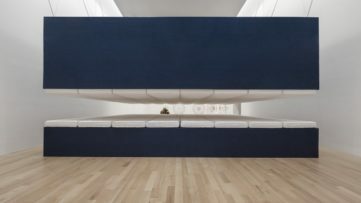 This show will also present Pace’s new gallery space, at 537 West 24th Street. Featured image: Tim Hawkinson – Ranting Mop Head (Synthesized Voice), 1995. Mop, lectern and mixed media; motorized, with sound. Overall: 68 x 43 x 20″ (176.4 x 109.2 x 50.8 cm) Mop: 68 x 23 x 23″ (172.7 x 58.4 x 58.4 cm) Lectern: 51-1/2 x 28 x 20″ (130.8 x 71.1 x 50.8 cm) Cable: 204″ (517.96 cm). 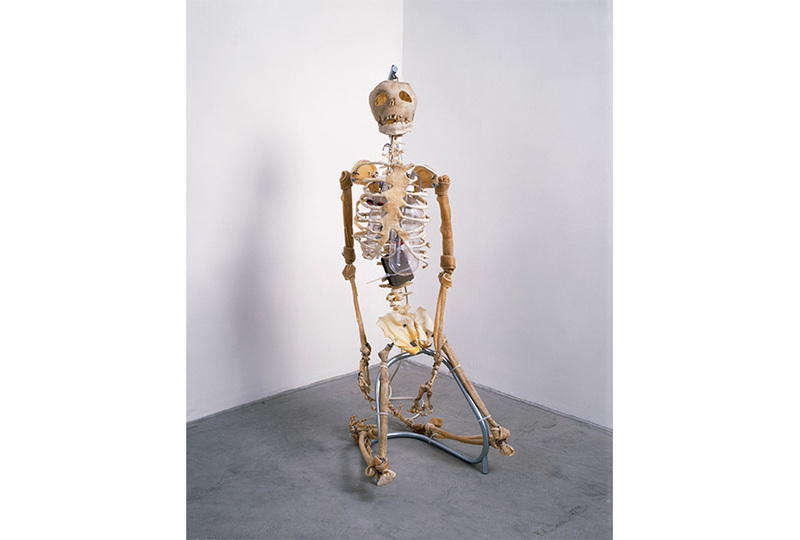 All images courtesy the artist © Tim Hawkinson, courtesy Pace Gallery.